Several art projects were commissioned for the interior and exterior of the Opera House. The most notable is She Lies, a sculpture constructed of stainless steel and glass panels by Monica Vonvicini. 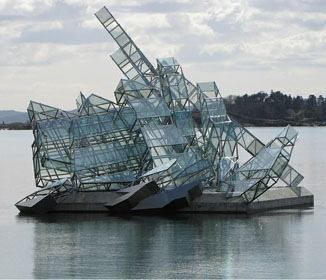 It is permanently installed on a concrete platform in the fjord adjacent to Opera House and floats on the water moving in response to tides and wind to create an ever-changing face to viewers. The work was unveiled by Her Majesty Queen Sonja on 11 May 2010. 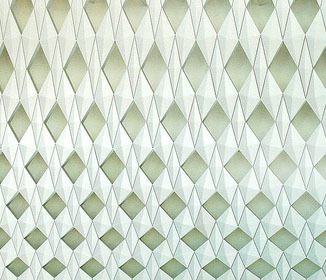 A perforated wall panel which covers roof supports in the lobby was designed by Olafur Eliasson. It features hexagonal opening and is illuminated from below and behind to create the illusion of melting ice. Other artists involved in the construction include Kristian Blystad, Jorunn Sannes and Kalle Grude who designed the shape of the pavers on the forecourt and roof; Bodil Furu and Trine Lise Nedreaas, who created a film and video project; Marte Aas, Talleiv Taro Manum, Tom Sandberg, Gerd Tinglum and Nina Witoszek Fitzpatrick, who created the art book Site Seeing; and Linus Elmes and Ludvig Löfgren, who created the foundation stone.